114/365 thewingsareback, originally uploaded by ajbrusteinthreesixfive. 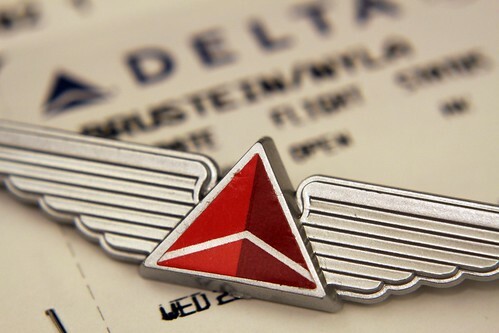 When I was a kid and flew I often got those cute little wings pins. They were metal and kinda cool, similar to the ones the pilots wore, and only the kids got them. Then they disappeared – probably cause I grew up, airlines got stingy, and I never really noticed. But today, on our flight back from LA, Nyla got her first pair of wings. They are cheap, plastic, and all scuffed up, but they are still wings, and still awesome. Anyway, as for LA, it was a good few days out there. Actually, I really like LA. With the exception of gas prices being ridiculous and traffic horrible, I really like it there. Especially Santa Monica. I could totally live there (as long as I had a 10 min or less commute with no use of the highway required). Great weather, tons of shops, the ability to walk around, and lots of other great things that come with city life (yes, I live in a “city” but it is hardly city life). So, it was my first trip to LA but I imagine not my last. Very happy that when we flipped the coin it landed on heads for LA.